“The key to good whiskey, the key to good bourbon, is good water,” Chris Ogden said. Sean Foley helped the Longhorns win three NCAA swimming titles. Ogden reached the 2003 Final Four. Thanks to distributing partners, Nine Banded already available all over Austin and Royal-Memorial Stadium. Austin has never guarded its best-kept secrets. From culture to cuisine, word spreads like wildfire. People come from all over to watch bats, listen to musicians both awesome and awful or stand in line at Franklin Barbecue. Same holds true for our local watering holes and what’s in them. Hippies flocked to the Armadillo World Headquarters just to pay 35 cents for Shiner in the ’70s. Granted, that was a nickel cheaper than Schlitz. Still, word spread, and Shiner Bock became just as synonymous with Austin as a Hurricane in New Orleans. Tito Beveridge took this town by storm in the ’90s, accumulated $50,000 in credit card debt but finally convinced distributors to start selling his concoction. Tito’s Handmade Vodka is now everywhere. 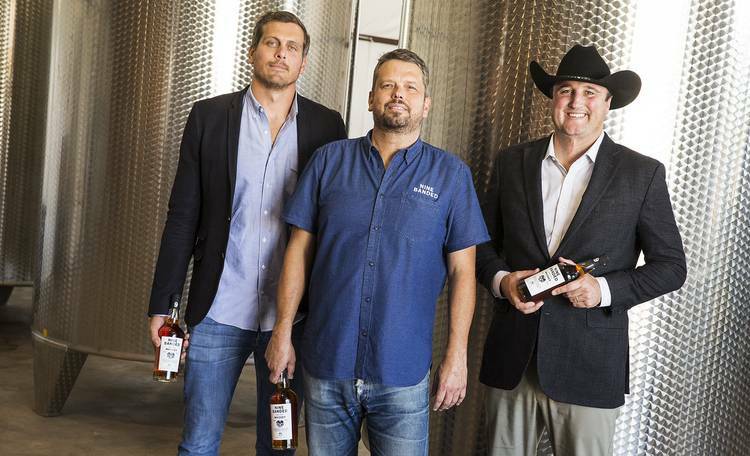 Sean Foley and Chris Ogden, two former Longhorns athletes, have a similar vision for whiskey. Made from 3-year-aged whiskey blended with Hill Country water from an artesian spring, Nine Banded Whiskey wants to the official drink of choice. Made right here in Austin, Texas, by God. Probably because nobody’s been able to strike the right mix of product, marketing and vision like the boys in Lynchburg, Tenn. Maybe that changes when word starts leaking out about this smooth-finishing blend that’s already gained some traction around town. Foley and Ogden both enjoyed athletic success at Texas from 2000-03. Foley helped the men’s swimming team win three national titles while Ogden’s basketball team reached the 2003 Final Four. All good teams need a coach, and Nine Banded’s co-founders joined forces with Gary Crowell, a visionary force behind Deep Eddy Vodka. Together, these three now operate out of a 5,000-square foot building in Dripping Springs and plan to ship 4,000 cases this year. The place can probably hold more than 50,000 cases, so the sky’s the limit. The story is immaterial if you don’t have a great product. Nine Banded’s triumvirate admits to using select pre-aged whiskey as its primary ingredient. The group has already started aging their own for future use. The special sauce may be the water itself, something Crowell found on a friend’s farm from his days as a Scout leader. “The key to good whiskey, the key to good bourbon, is good water,” Ogden said. The whiskey and water are blended to a certain taste and bottled on the spot. It has a lighter color than some whiskeys since they do not add coloring or much of anything else, Crowell said. It’s a no-frills product, frankly, something by design. The traditional bottle, with a white numerical “9” printed on the neck, is easy to spot from a customer’s point of view. Or, look for the hand-drawn armadillo, a nod to the Armadillo World Headquarters itself. It’s easy for bartenders to grab and pour, not like some of these tricked-up bottles you see clogging the aisle at Spec’s. Every 1,000 liters brought back from the Hill Country doesn’t last long. Pallets of 100 cases are flying out the door. Nine Banded has already become the house whiskey at Donn’s Depot. It’s made its way into menu items at Odd Duck and Snooze, along with being readily available at Holy Roller and Kimpton Hotel Van Zandt. Thanks to a distributing partnership, you can also get Nine Banded in the suites at Royal-Memorial Stadium and at Texas A&M’s Kyle Field. From the looks of it, Nine Banded is well on its way. Austin’s famous Oscar winner promotes something else, but maybe that’ll change some day, too. “It’s by Austin entrepreneurs for the Austin community,” Foley said. Ogden dons a black cowboy hat and puts a finer point on it. “Bottom line, we want to be Austin’s drinking whiskey,” he said.